Those "Killer Flaps" looks amazing. But I cannot convince myself spending 10K Cdn$ yet... A guy could maybe built himself something similar for way less. If backyard design/built then not certified, only good for experimental if homebuilt. These are like jewelry, took many years to get them approved too. Try making something like these on your own and see how they might work. These really work and are an excellent addition to certified cub. I'm going to agree with this. I don't think it changes the force in retrospect. I asked Airframes if they could make a new handle with a bend - no can do - has to be same on certified plane. Since this is just a grip that slides on it was the best solution I could find and it really helps. I think that I get it now. You physically can not move your arm back far enough to engage the last notch of flaps due to the tight space between your body and the side panel. So the L extension is really just pushing the lever further aft The force required isn't any less, you just don't have to put your arm behind your back. I assume that you push the release button with the heel of your hand rather than your thumb. You have obviously not looked at the amount of sheet metal and machine work that went into making these flaps. 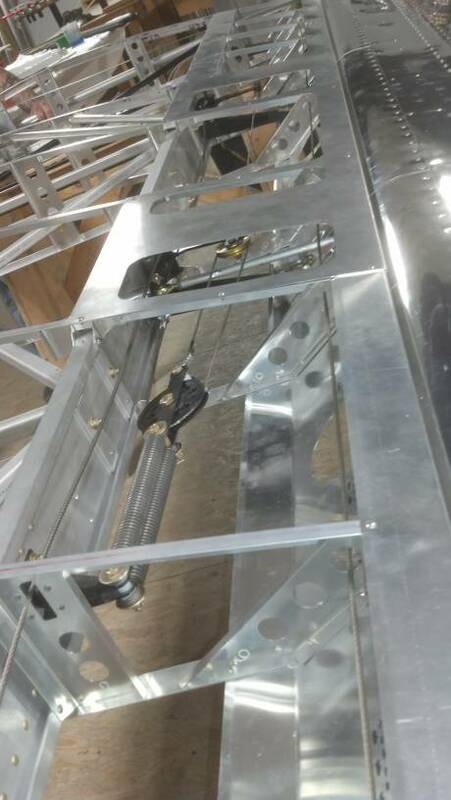 There are complex bends in the sheet metal in the first and second segments that have to be made to have all the contours correct so they nest nicely plus the leading edge bends. Then there is the geometry of the vane hangers/extenders/linkage that makes these things work properly. It's not that you could not do it but if you value your time I don't think the price is out of line. That would have definitely helped. The STC for the flaps also includes the option for the shortened flap handle. It would have been great if that was included in the STC. Would like to have a closer look, but non of these around here. If money was not a factor, I would have bought a set a while ago. I will continue to explore a way to fabricate myself something similar for way less money, but much more time, like I always did. That is the fun part I think. Look at the Rev 3 flaps. Simpler and lighter. Performance reports are good. A guy could fab those easier than split flaps. Big chord, big span, and ducted leading edges. I'm looking forward to seeing more of them flying. Or, here's a novel idea. Create something better! Last edited by stewartb; 11-07-2018 at 06:51 PM. Will be hard to make flaps with dual slots and all lift from them, vs drag on stock flaps any better than the Keller flaps in my view. Doug worked to perfect these for years. They are jewelry and work perfectly and also look very cool. Doubt anyone doing a one time one off set will come up with the details and function of Doug's creations. Much less be certified. If experimental cub, then go for it, but the lift from these, like a Husky flap is what gives the performance improvements. Slower controlled flight, slower stall, nose down attitude, etc. They do it all. Doug seemed to make it all work. And they are perfect fit on a stock cub. Plus certified. Just my view. Like experimental stuff too, but these are hard to beat for standard cub. Costly, but best bang for the $$. I think these flaps are probably worth every penny. Do I have this right - the kit only costs $8400 US? However, if they are no better than the Husky flaps, I would pass, unless Husky made some major improvements beyond the B model. bob, Husky flaps are at least twice the length of Cub flaps so that is comparing apples and oranges. The comparison needs to be made on flaps of the same length. Doug built a Super Cub with Husky flaps many years ago. I sold him the flaps and hardware from a wrecked border patrol Husky I had. The Performance flaps must be better since he spent the time and money to certify them. Re: comparing flaps of the same length? My impression of the much longer Husky flaps was that they were not nearly as good as a stock set of Super Cub flaps adjusted to the max allowable extension. My guess would be that the more effective Cub flaps would be even better if Husky length. I think my opinion is worthy. Next question: has anyone installed these STC flaps on a Dakota slotted wing? Yah, imagine longer split flaps with slots, or better yet, slats. That might work, huh? And why do you guys install flap gap seals??? The Husky flaps are for sure longer, but far bigger slot in them when fully deployed compared to Keller flaps. The Keller/Airframes AK flaps are a bit deeper, extend a bit past trailing edge of wing than stock cub flaps, and have two slots. My view is they work well as they do extend further down than stock and Husky flaps, and have the two slots, probably giving some added lift with airflow going through two narrower slots rather than one big one. Not sure of aerodynamics there, but just my take. Most guys flying Husky's pick the tail up like one does in a cub for takeoff run. Not needed in Husky as flaps are creating lift. Just stay three point, stick back and just levitate. Sometimes tailwheel is still last thing on the ground. Shortest way to get off in Husky. Keller flaps are a bit similar, but I cannot tell much difference in raising tail in cub with them vs. not. Still levitates. Most raise the tail on takeoff in all taildraggers. My experience is that doing so always results in a longer takeoff roll. It might be necessary in a few airplanes that lose aileron response at low speeds, but the only time I raise the tail is when the student is rudders only. I remain unimpressed with the Husky, except for its cruising speed. A good Super Cub is much more fun to fly, flaps or no. Most Husky pilots in the lower 48 are taught to approach at 60. That works in a Cub, but in a Husky you will miss your turnoff if you come in over 55. I believe it is because of the flap extension restriction. I have a cub with the Airframes/Keller flaps and 2 Husky's. Both Husky's are lighter weight than normal ones so perform better. One not quite finished yet, so actual weight unknown until next month, but should be well under 1200lbs. Other one is 1309lbs with 31" bushwheels and extended cub gear. Lycon built 0360 engines that dyno about 220HP. One has to fly a Husky far differently than a cub. Cannot point it to the spot and land there like a cub. Have to slow it up under 50 on approach, in three point attitude and plop it down where you want it to go. As you say, too fast and you completely miss your spot. Key is slow flight and nose high to make the spot. I see most guys in lower 48 going way too fast, so no performance anywhere near cub. Cub will get in and out a bit shorter for sure, but not by much compared to my Husky's. I personally like flying the Husky better as they are more comfortable, a bit roomier and more solid to me. And of course with constant speed better rpms and less vibration. And Husky is far faster. Like the cub and Husky, have both, they just fly and have to be flown differently. [QUOTE=Olibuilt;731156]The thing is that my wings are different than stock, my fault. So keep the tail up when you don't want to leave the "runway" (so you don't bounce off it sideways before ready to fly in the gusts and bumps) Then put the tail down when you're are ready to fly. The rest of the "how to" is moot if you're not in a restricted space or gusty crosswinds.. do it anyway you like. Also, if you are in a very restricted space, leave it on the ground until the last of the runway. That way, if you stand a chance at all, it will work. .... soft fields notwithstanding.. them.. be like on floats.. lift one a little bit.. let it accelerate to the very end.. then try it..or crash, but don't try to take off early on a short field. Usually if you keep it on the surface it will fly without any extra help before the end unless you seriously made a mistake. If you try to fly too early you might cause it to go off the end..
if you are in a very restricted space, leave it on the ground until the last of the runway. Yeah, sure beat the hell out of your tail if you like but lifting the tail is not going to hurt your take off if you know what your doing. I am use to flying in and out of 300 feet or less with maybe 10 feet or less of margin either wing tip, I am probably light so I will lift the tail every time. That is the beautiful thing about the cub is the tail is light and you can lift it, it is a lot harder to do with other aircraft and that is the thing I usually hate the most! If I need my shortest takeoff the thing that makes it happen is the flap lever, and if I'm pulling flaps to get off quick I need to have the tail up so I have full authority of the elevator in a relatively flat attitude. If I want to use every inch I delay pulling on the lever until I have to, and at that point I've maximized my speed in the available space. Stewart, are there any more pictures besides the one in the Daydreaming about Flaps thread? I'm really curious to see where the ducting outlet is. I was talking about the airplane itself when I referred to leaving "it" on the runway. Mauleguy, happy for you and your small area accomplishments. My work plane has good vis over the nose but I don't seek out tight spots. I only let my tailwheel touch the ground when I have to. Stewart has it right in his statement about waiting until he has to make his best move. That was my point. I'm in the process of installing the slotted flaps from Airframes Alaska. The slotted flaps are a bit heavier than the ones I built from the D&E kit. There were a number of problems because I had built flap and aileron hangers of my own design to accommodate the D&E flaps and ailerons, but I have worked out all of the problems but one. The flaps are too heavy for the flap return springs. The flaps will not fully retract. The springs that I am using I procured from Univair, so I'm looking for a solution. Stronger springs would be the obvious way to go, but I don't know where to get them and I don't feel like having them made at the local spring shop. You can try the Univair heavy duty flap springs but I've heard guys have had them break with PStol flaps. My flaps are longer than yours and I use four of these on each flap. Two on a yoke and cable to each bell crank. They work well. Last edited by stewartb; 02-04-2019 at 03:34 PM. I can't tell from the picture, but it looks like you made a yoke and cable in place of the long wire that comes off of the stock spring. Good idea. Currently just one spring per side that I got from Univair. I got this setup from Backcountry Cubs. Basically it's like a little block and tackle. You have the full strength of the spring holding the flaps up. But because of the two pulleys, the springs only streach about 1/2 their length with the flaps fully extended. I'm still building my plane, but in the shop it works nice. My only complaint is the cable clearances are tight. I had to add a small pulley to an alieron cable so it would clear. Rev 2 or 3? That's VERY different from my Rev 2. Probably in response to how a few Rev 2 builders were struggling with flap droop and cable tension. Do you have a pic of your flap bell cranks? I'd like to see if that changed, too. How much flap angle are you targeting? I got the fuselage and wings from Nick Smith before he sold the company to Backcountry Cubs. It's my retirement project and I recently retired. The wings look to me like PA-12 based. I would guess the bellcrank to be stock. I bought the spring setup straight from BC Cubs a couple of months ago. I assume it's their latest and greatest. I believe Dakota Cub makes a stronger spring, not sure of that - correct me if I am wrong. Mine will sometimes blow down a little when taxiing downwind or at the fuel pump. But I would have to cut an access hole in the wing to change it out and they might be harder to pull with the short flap handle. But I would have to cut an access hole in the wing to change it out and they might be harder to pull with the short flap handle. Very cool design. Unfortunately, That would require cutting a lot more fabric that I want to do. Thanks for showing it. Things do get tight behind the rear spar. See flaps working on final. Move the cam to see lot of views! Very Nice! I have to get one of those cameras!